While searching for No Knead bakes, i came across this overnight bread. Quite a simple recipe, just mix flour, salt and yeast with water. Add any seasonings you like, rest it overnight for about 12-18 hours, shape and bake . I have tried 2 savory breads and one fruit bread with this recipe. All came out super good. All the 3 times i baked half the recipe given below. Since the dough is rested for long hours,the amount of yeast is very less. I m sharing picture recipes of the savory breads i made with the recipe. Since i made a very small loaf,it got over the same day even before i could take a decent photo. The savory bread can be paired well with a soup or a salad for a filling meal. I made 2 versions with the above ingredients. I mixed the dough with yeast and salt. Divided it into two half and added fruit to one portion and savory to other portion. It is up to you to bake a sweet or a savory bread completely. Take flour,yeast, salt into a wide bowl. Whisk well to combine. Add the fruit/savory ingredients to this and mix well. Now add water to it and mix well with a spatula. Cling-wrap the dough and refrigerate it overnight. The dough has to rest for 12-18 hours minimum. I made the dough in the evening and baked it next day morning around 12 in the afternoon. After 12 hours of resting, take the dough out of the fridge. Prepare the loaf pan with parchment paper. Dust the dough with flour, and shape the dough into a loaf and place it in a loaf pan. since i used half the above recipe i baked in a small loaf pan. Let the dough sit for 2 hours. Preheat the oven to 200C and bake the loaf for 20-22 minutes or until the top turn golden brown. Remove the loaf from the oven, transfer it to a wire rack, let it cool completely. Cut and serve with your favorite spread. I served it with nutella to my kids and whereas we enjoyed it as such warm. Terrific bread ! Tempting me to the core:)) looks very flavorful Priya. Loving all your breakfast bread series. Will try out the spicier version though the dry fruit version is also looking good. I am all for this bread.. so tempting, so flavorful and so simple!! 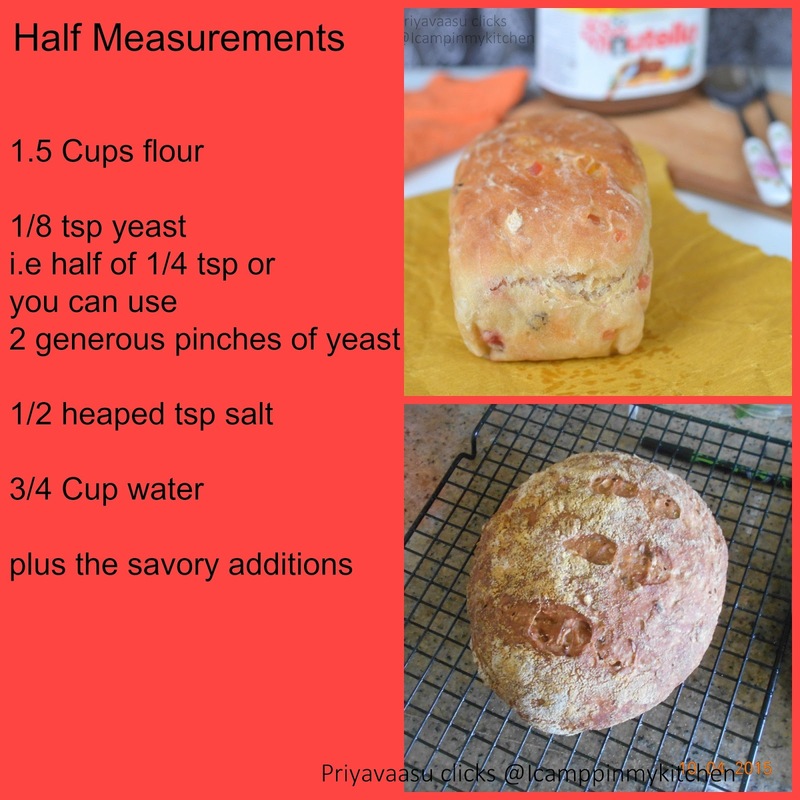 Looks wonderful priya..hope you shared the other two savory versions as well..If you have already, just point out pls..want to do it..and also do share your exact half the measurement...lazy to do the math myself!..this fruit bread looks awesome! Really simple and tasty bread! Love the crumb. It is so good! I am sure the flavor would be awesome given the long rise. Looks wonderful Priya, am in love with the crumb, those fruit chunks are just fabulous..
Looks awesome priya..we too liked the no knead bread a lot...such an easy way to make bread. Your picture recipes are awesome Priya -- very handy & convenient. That no knead fruit bread looks yummy. Looks amazing Priya. After seeing so many no knead recipes, I am tempted to try it..
Nicely baked and fruity bread. Your no kneads are coming out very well. Love this one with the dry fruits.